Yay for May! It's Mother's Day month! Being a teacher/mum means you usually need to plan a gift + card for your class to make to give to their mothers or special people in their lives for Mother's Day. 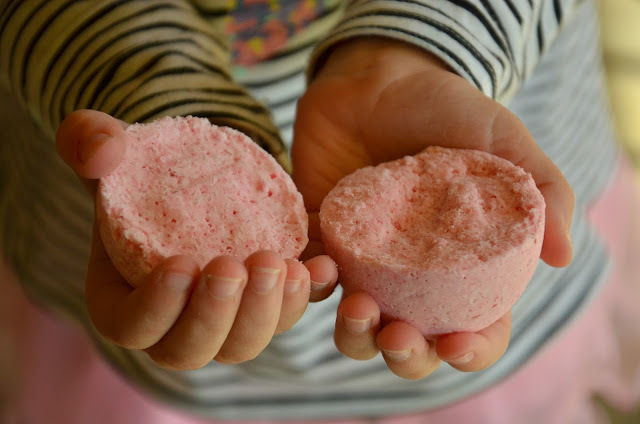 During our planning meeting I had the brilliant idea of making bath bombs with the students, because it would tie in perfect with our Science unit on mixtures and chemical reactions. Yay for integrated learning opportunities! So Miss M and I had a practise run, because I've never made them before and I wanted to be confident that they would work when I do them at school. She has decided to give them to her Nanna and Aunties for Mother's Day (she has loved bath bombs even since I bought one home from her from Lush - and I get her one every time I go to the city!). But making your own is faaaaar cheaper and an educational experience too. Simply combine the dry ingredients, and then watch the "fizz" when you add the water as it reacts with the bicarb soda and citric acid. Mix together until you can form it into clumps. Press into the moulds, leave for 5 minutes and then carefully press them out and allow to completely set for 24 hours. (I used sphere ice cube moulds, but found it much easier to just make hemispheres!). 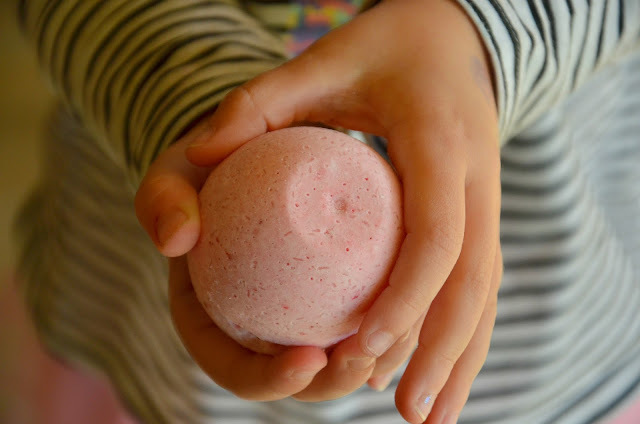 We decided to make pink frangipani scented and yellow vanilla scented bath bombs. TIP if you're making this for a class of students - do the maths and make sure you have enough ingredients to make enough for everyone! The plan is to have small groups of students making the bath bombs, while others are writing up their procedures of how to make them. I thought a demonstration first of one of the pre-made ones would be a good idea to get their minds in the "science zone" and be excited about the gift. Cannot wait for this lesson! What a fabulous idea, and so easy too. Thanks for this, it's wonderful!